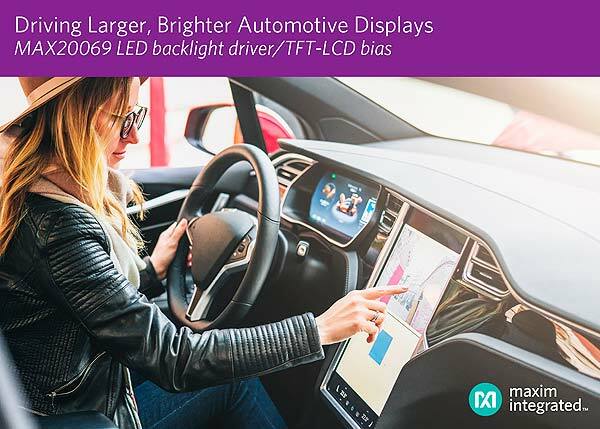 Automotive infotainment designers can now upgrade to bigger, higher resolution displays with greater ease, reduced cost and smaller solution size with the MAX20069 from Maxim Integrated Products, Inc. The MAX20069 provides the industry’s first solution integrating four I2C-controlled, 150mA LED backlight drivers and a four-output thin-film-transistor liquid-crystal display (TFT-LCD) bias in a single chip. The IC can reduce design footprint up to one-third compared to the closest competitor’s parts.